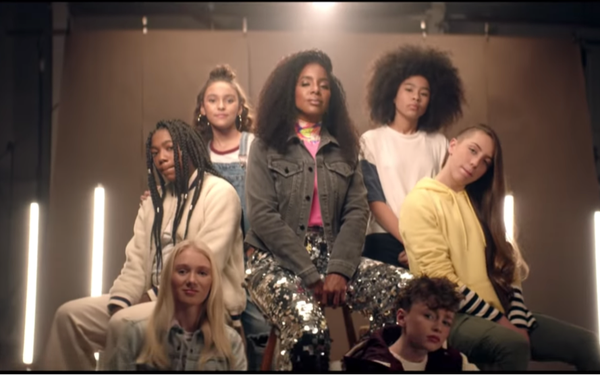 In its ongoing mission to defend young women against a world full of hair-haters, Dove has teamed up with singer Kelly Rowland to release “Crown,” a single meant to help girls lock in hair confidence. The video channels true tales from a cruel world, including a pair of 11-year-olds who got expelled for wearing hair extensions to school and another 11-year-old who was bullied for cutting her hair short. Girls with red and blonde tresses detail the nicknames they endure. The two-minute video is scheduled to run during “E! Live From The Red Carpet: The 2019 Grammy Awards” this weekend. And the company is promoting it on both You Tube and Vevo, in hopes that girls everywhere will seize the anthem as an opportunity to tell the world’s hecklers to shut up about their hair already. The company says it based the new effort on research that found that 65% of young girls view their hair as a form of self-expression, yet 50% also say it makes them feel self-conscious. And 71% of those it surveyed say music is an influential factor in their lives, which led to the decision to use a song to deliver the message. The single is set to be released on Universal Music’s Island Records UK, and is also available on streaming platforms, as well. "Dove wants all young girls, and women, to have the confidence to wear their hair any way they choose, and to see their hair as a source of confidence, not anxiety," says Piyush Jain, vice president of marketing and general manager of hair care for Unilever, in a statement. "We are committed to celebrating all hair types, especially for young girls who start thinking about their hair's appearance as early as age seven." Additionally, the company says it will incorporate the idea of expressing hair-confidence in its workshops. Rowland, who first burst on the pop scene as a member of Destiny’s Child, will serve as a mentor in its programs at a local Boys & Girls Club as part of the Dove Self-Esteem Project. So far, the company claims to have reached 29 million young people, and hopes to include another 20 million by 2020.